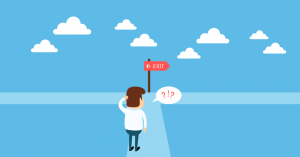 What is exit-intent and how does it work? Does your website suffer from high bounce rates? Did you know that even the bounce rate does not reflect how little some visitors will do on a site? As it turns out, as much as 98% visitors will leave the website having done nothing. This is extremely high but does represent an opportunity to increase conversions and sales. This is where exit-intent technology comes in. Exit-intent is technology that is meant to detect the moment just before a user exits the website. This is done by monitoring the users’ mouse pointer movement and reliably predicts when the user is about the exit the website. It is possible because the standard buttons on the browser are well known and can be used to predict the destination when the mouse is moving in that direction at a specific velocity. Just as the mouse is about the pass the top of the website, an exit popup opens. This works because every user who is about the exit is presented with an opportunity to gain something from staying. Options for the popups include surveys for credit, competitions, prizes, discounts, free shipping or exclusives. What is great about exit-intent popups is that the effect can be seen almost immediately. By design, it does not present itself to visitors who intend to purchase. This way some sites see an immediate 2-4% increase in sales from the popups. According to some, the increase in conversions can be as high at 10-15%.